Improper handling may cause serious, life-threatening injuries. Fractures and dislocations of the back, most often resulting in paralysis of both rear legs, are the most common injuries. These injuries occur when rabbits are suddenly frightened and attempt to escape from a small enclosure. A rabbit's spine is relatively lightweight and fragile. When a rabbit becomes frightened, it violently struggles by powerfully kicking its back legs. The lightning-fast movements of the rear legs cause overextension of the lumbosacral (lower back) region of the spine, which frequently results in fractures or dislocations. One should never try to overpower a struggling rabbit. If a rabbit violently resists physical restraint, it should be immediately released and approached later when it has calmed down. 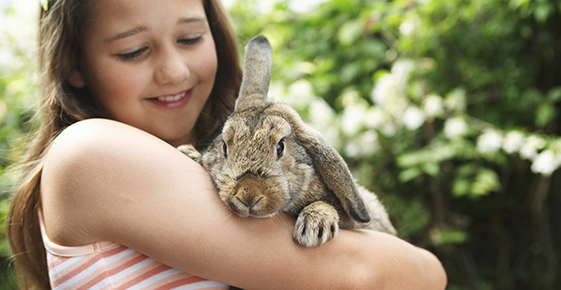 A soft-spoken, relaxed approach with rabbits works well. Covering the eyes and lightly stroking a rabbit will usually result in a hypnotic-like trance that often renders them less prone to panic and injury. Rabbits should never be picked up by their ears. If you are concerned about being scratched by the claws, place a towel over the rabbit's back and wrap it around the body to restrain all 4 feet before picking up the rabbit. An alternative method of picking up a rabbit involves sliding one hand under its breast bone and grasping both front legs between the fingers of this hand. The other hand is then gently worked under the rear quarters to fully support them as the rabbit is lifted upwards, in the same manner as cats are held.